Tha Lake District National Park Authority is considering two applications for strengthening bridges over the line in a way which would block the route for trains in the future. CKP Railways plc prepared a design package for the railway 15 years ago. A Business Case report in 2007 showed a financial case and many other benefits for the Lake District and beyond. Communities, businesses, Train Operators and the Lake District National Park Authoirty want the railway. Despite all this, Cumbria County Council refuses to even express support for the project. More details in Update 64 - available for download via the "Newsletter" page. 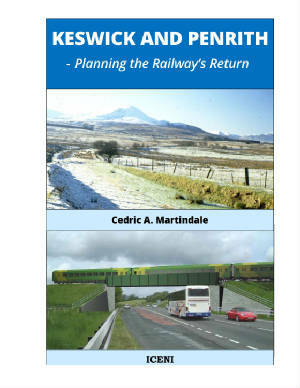 For every copy bought direct from the publishers, 25% of the price is passed to the Railway Project. from other parts of the country. The line will be independently built and managed by CKP Railways plc, which is locally based. This type of independent operation, connecting into the National Rail Network, was made possible by the 1993 Railways Act. It will be the first project in the UK to re-open and operate a complete line in this way for an all day, every day public service. Virtual reality image of new bridge across the A66 at Beckses, west of Penruddock. The route from Keswick to Penrith is rich in history and heritage, but it would not be appropriate to re-open it as a Heritage Railway. The new Railway needs to provide fast inter-regional links to and from the North Lakes , providing transport for everyone to help the local economy expand, reduce pressures on car parking, reduce the impact of road traffic on major and minor roads in the Northern Lake District and reduce dependence on cars. Benefits for Penrith will include reduced pressure on car parking by allowing people travelling to or from the Cumbrian Coast to use cars less and not need to park in Penrith. Travel between Keswick, Penrith and Carlisle for work, education, health and social appointments, shopping and leisure will all be made quicker and easier for everyone. More people travelling to and from Keswick by train will provide more customers for local public transport (buses, taxis and boats). Many visitors to the area do not use cars during their stays and would happily come by train - further reducing traffic and parking problems as well as saving valuable fuel. Having a connecting train service to Keswick will mean more main line trains stopping at Penrith on the West Coast Main line - reversing the trend of the last few years. 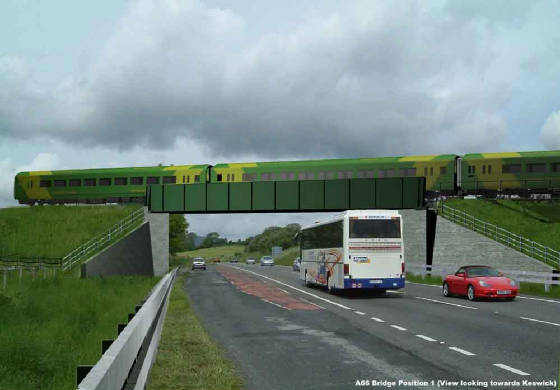 It is also the first step towards restoring fast, reliable and sustainable transport links to the Cumbrian Coast. All feasibility, design and development work has been paid for by the Project's supporters. Approximately £ 400,000 was raised from sales of Bonds. The Directors are unpaid, ensuring that all funds received are spent on development work, not overheads. CKP Railways plc is exploring various possible sources of funding for the final legal and construction stages. Government does not fund local Railway re-opening schemes, so the final package of support for this Railway is likely to be unusual and interesting. You are welcome to contact us with any thoughts or suggestions. Please use the link below to our "Contacts" page. More about books, DVDs etc.